World enterprises are struggling these days with a big question: how to move forward to the next generation 3rd platform applications. In some of the organization the transition starts from a business need, and in others, the development teams are pushing for the change. While most of the development departments within today’s organizations are already starting to adopt the new 3rd platform development tools, the IT departments find themselves in a strange situation. The developers are starting to take infrastructure decision and are sketching a new IT horizon. This Facebook, Google and Amazon approach is right when it comes to large organizations that develop mass scale applications but mostly does not fit the typical enterprise that has limited development and IT teams. One of the most common approaches for today’s 3rd platform apps is using software containers to build a microservice application. While software containers are an excellent way to package and ship applications without the need of a complex infrastructure to rely on, most of the container’s management systems are focusing on placement, shared API, and process management and still depend on a general purpose O/S to run the containers loads. This general purpose O/S usually known as the “Container Host” is the place where all containers run as separated processes. Some companies had created a stripped down O/S that has only the basic functionality of running containers, among this solutions are VMware’s Photon O/S, Tectonic Core OS, Project Atomic (sponsored by Redhat), Ubuntu core and Microsoft’s Nano Server. So when going back to the traditional enterprise dilemma, there are the two ways of deploying containers in an organization. “Top Down” approach: The most common used today and developer-centric, basically it gives a container API to the developers and sprawl container hosts on physical or virtual servers leaving the developers to maintain the Container Host O/S. “Bottom Up” approach: A new approach that distributes the responsibility and sponsorship between the developers and the IT departments empowering the developers with architecting the app and the IT with building a dedicated Container infrastructure platform aligned with company policy and share it’s API back to the developers. There is no right or wrong here! The top-down approach fits mostly large corporates that need to build a mass scale app to serve billions of users (Facebook, google, amazon) and usually create their own container host flavor and tools to deploy and maintain it. The bottom-up approach fits organization that needs to adopt containers as a part of a wider team strategy and still needs to maintain company IT policy. This company usually rely on a standard solution that have a known architecture and full support from the supplier-vendor. Taking into consideration the virtualization revolution that created a new “Data Center Operating System” to minimize the dependency in the general purpose O/S, we can use the same architecture to help enterprise organization in the transition from the 2nd to the 3rd platform. The first step will be to run containers side by side along with the 2nd generation applications. Most organization will develop their mobile and internet apps using containers while continue to run the primary and backend applications on 2nd platform solutions. While containers technology and microservices architecture adoption increase in the organization the need to develop a native but trusted platform to run containers arise. With this to take into consideration, the new bottom app approach architecture will be the most suitable for the enterprise to adopt. VMware’s Photon Platform is the first enterprise-ready solution based on an industry proof micro-visor and controller utilizing all the experience and knowledge VMware gathered for the last 15 years running enterprise production loads at scale. A micro-visor works with the VT (Virtualization Technology) features built into Intel, AMD and other CPUs to create hardware-isolated micro virtual machines (micro-vas) for each task performed by a user that utilizes data originating from an unknown source. The micro-VMs created by the micro-visor provide a secure environment, isolating user tasks from other tasks, applications, and other systems on the network. Tasks, in this case, entail the computation that takes place within an application as well as within the system kernel, so the micro-visor ensures security at both the application and operating system kernel levels. Utilizing VMware’s CMP (Cloud Management Platform) NSX and vSAN technologies will assure a production ready containers infrastructure platform that can be managed by the IT systems with proven and known tools while giving the developers the best API access to industry standard containers development systems. To better understand how this solution help Organization IT to evolve, watch my Cloud Native Apps Demystified Presentation. Aviv Waiss is a Principal Systems Engineer at VMware. Cloud Management Platform and Cloud Native Apps Specialist. As a Part of the collaboration between VMware R&D organization and our customers, we held a unique event where our top Israeli customers met the EPops Agent development team, heard about the technology behind the solution and shared with us their perception and ideas. We got great interaction with the customers, lots of valuable feedback and understanding they’re requirement and challenges, excellent off session conversation about running and future projects. Hilik Present the Israeli R&D Center. Ehud present vRops value and mission. Having fun in the new training center. Dan explains how to develop your own solution using EPops agent. Plugin development in action !!! Dan simplified new solution development. Thanks to everyone who contributed, submitted and participated in the event!!! Ronit’s roadmap presentation can be presented one on one to NDA customers. 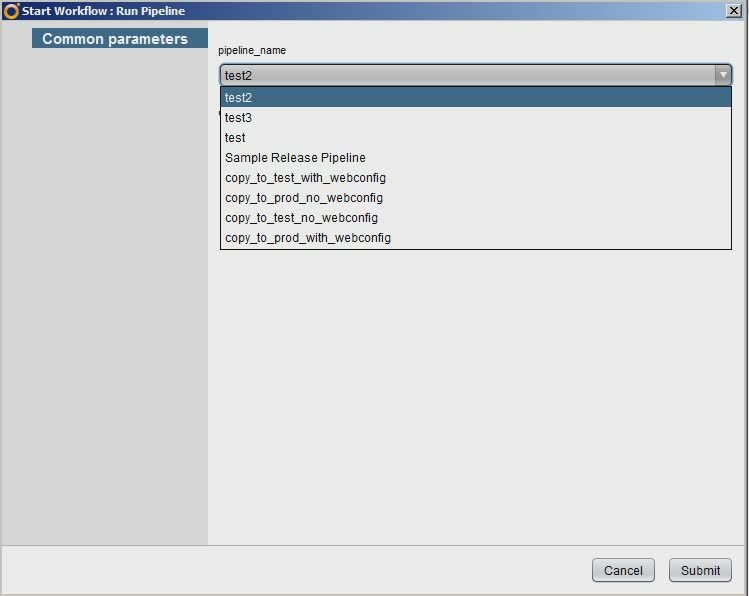 vRealize Code Stream pipelines can be executed in couple of different ways depending on the customer scenario. 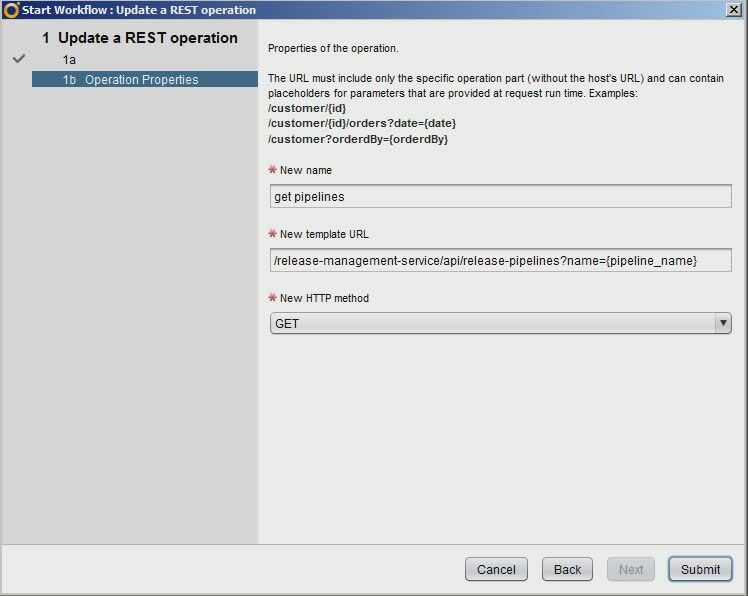 One option is to use the execute button in the pipelines screen, this will execute the proper pipeline. Another option is using the rest api to execute a specific pipeline. There are some sample scripts and code in vRCS documentation that explain how to interact with vRCS Rest API. In this post i will show how to use vRealize Orchestrator HTTP-REST plug-in to execute a vRCS pipeline. This is very useful in a use case where we need outbound developers or DevOps engineers to trigger pipelines based on specific roles and permission. It can also help where we are using vRO API as a central API for cloud and SDDC and need to trigger multiple actions in multiple products (vRA, vRCS) from external apps. Open your vRO client and go to Library> HTTP-REST> Configuration. 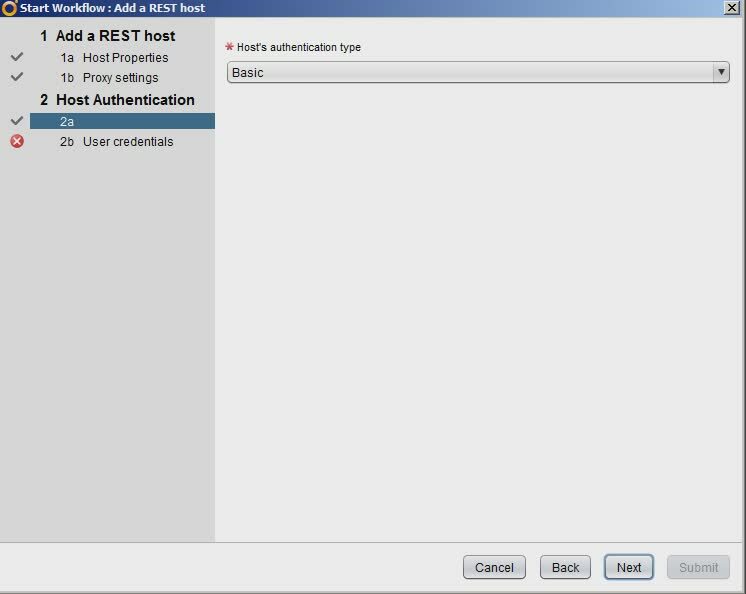 in the last screen enter your tenant username and password to complete the process. 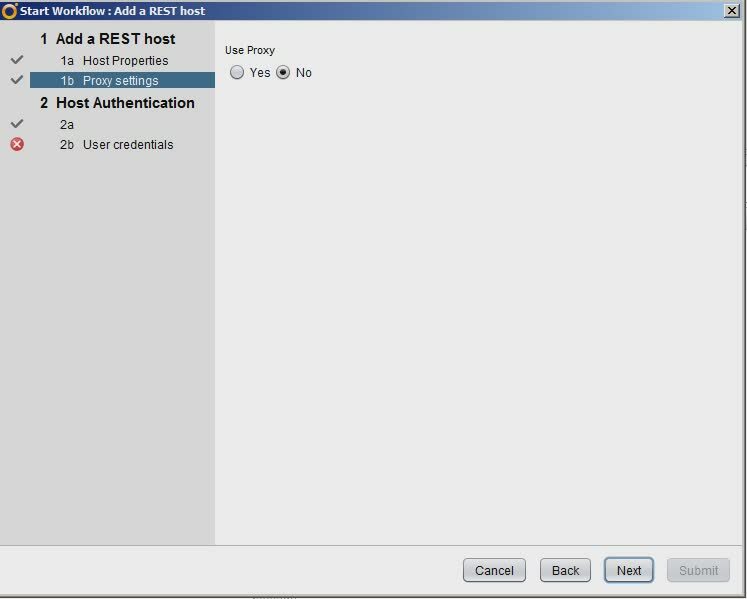 Now we need to add some rest activities that will define our rest calls to vRealize Code Stream API. 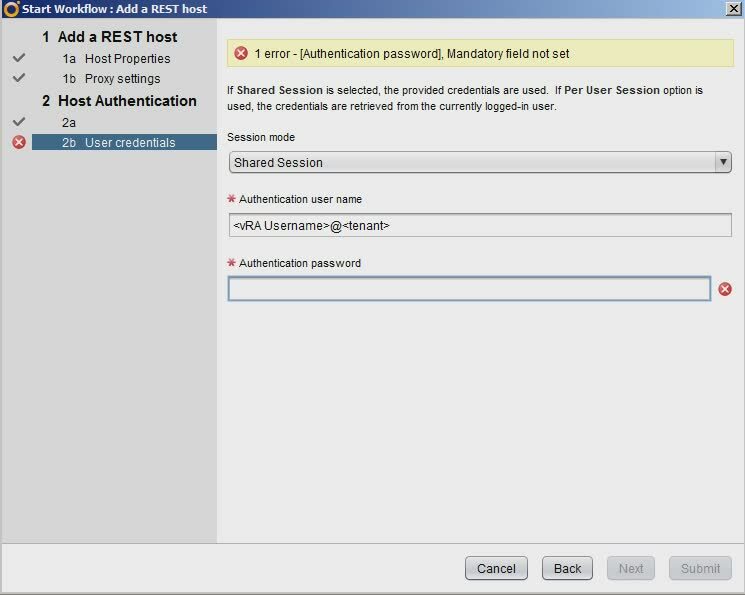 REST Operation 1 – get vRealize Code Stream authentication token. In this call we will authenticate against Code Stream and get the Authentication token, it will be used later in other API calls. 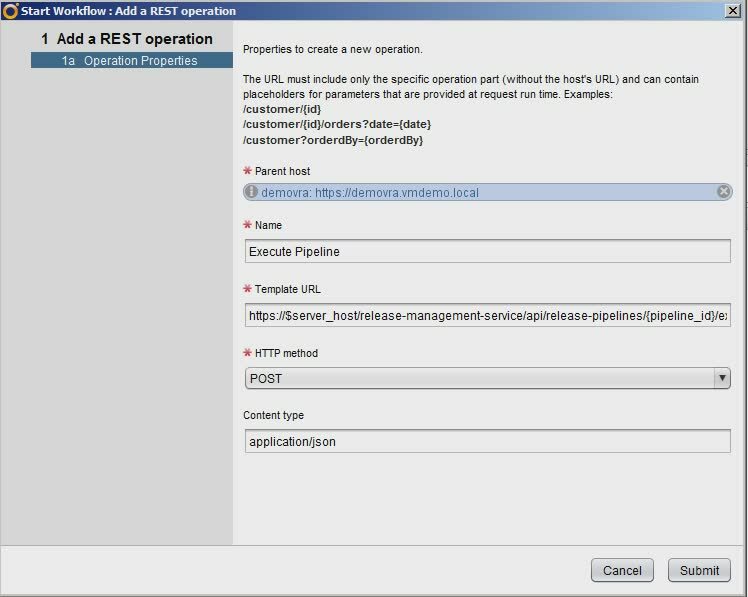 REST Operation 2 – get vRealize Code Stream pipeline list. In this call, we will use Code Stream API to get the pipeline list. We will use this list later to choose the right pipeline to execute. 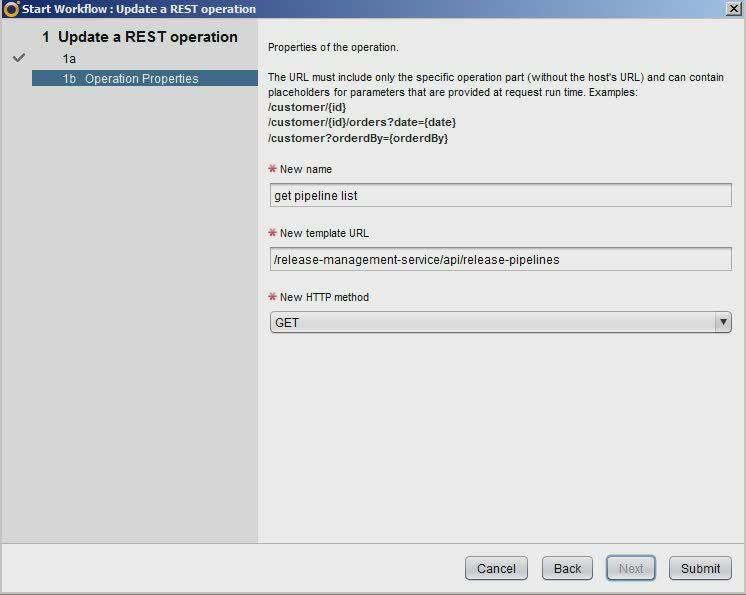 REST Operation 3 – get vRealize Code Stream pipeline information. In this call, we will use Code Stream API to get a particular pipeline information. We will need to supply the pipeline name. We will use this later to get the pipeline running status. The information that comes out from this call is in JSON format. 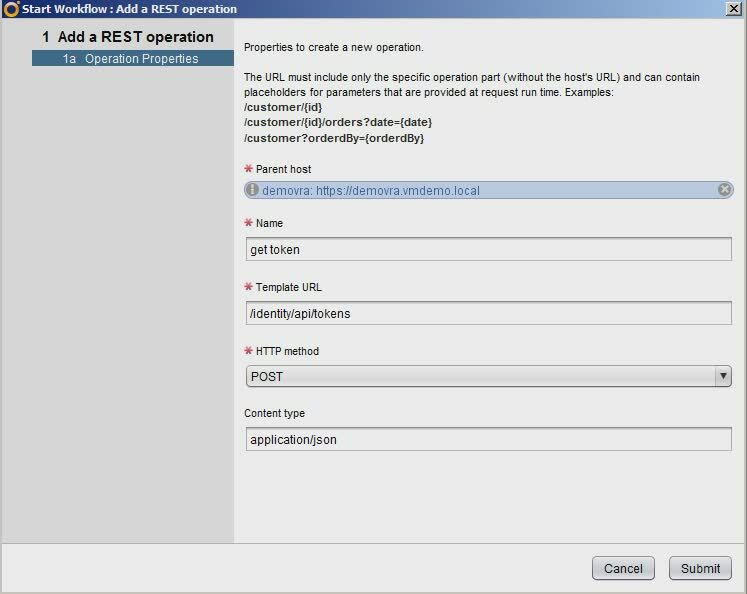 REST Operation 4 – execute vRealize Code Stream pipeline. In this call, we will use Code Stream API to run a pipeline. We will need to supply the pipeline ID. workflow to run a pipeline. You can just create a vRO workflow from each REST operation by running the “Generate a new workflow from rest process” workflow. This will create a simple workflow that will let you input the right parameters and execute the particular RSET call. to make life easier I have created 3 vRO action to represent the REST operations and a sample workflow to run them. Go to vRO main screen and press the “import package” button. Choose the place to add the package. 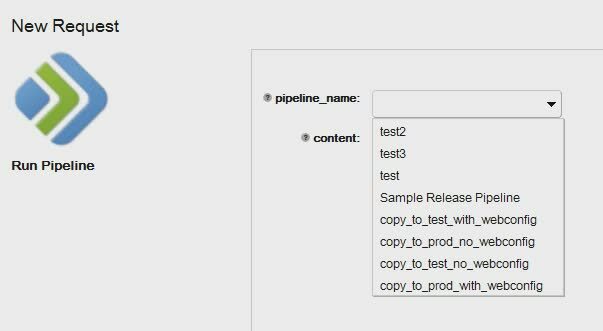 Find the “Run Pipeline” workflow. Edit the workflow and go to the General TAB to see the workflow attributes. username – your Code Stream username (user@domain). password – your Code Stream password. tenant – your Code Stream tenant. tokenRest – link to the get token REST operation. listREst – link to the get pipeline list REST service. getPipelineDetails – link to the get pipelines REST service. executePipeline – link to the Execute Pipeline REST operation. Save the “Run Pipeline” workflow. Choose the pipeline you want to run. 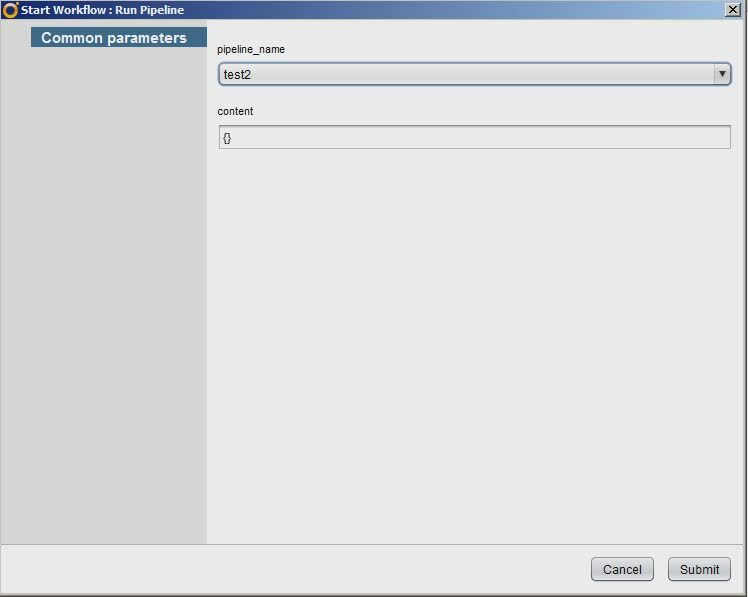 if you want to supply pipeline parameters enter them in JSON format in the content section. Press Submit to run the pipeline. 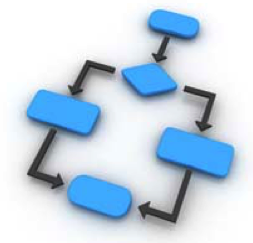 The vCO workflow will execute the pipeline and wait until it’s completed. Open vRA and go to the Advanced Services TAB. Press Add and select your workflow from the list. Press next until the wizard finish. Go to Administration TAB and select Catalog Items. Press the Code Stream workflow you just added. Check a particular Service to insert the workflows too. Press the checklist near the pipeline_name, and you will get the list of pipelines from your Code Stream server. A new request will be initiated in vRA, the request will stay open until the Code Stream pipeline is completed. This is Just an example on how to use the vRO HTTP-REST to execute Code Stream pipelines. 2U 4-nodes hardware platform optimized for EVO:RAIL and provided by selected OEM partners. Improved business continuity & disaster recovery. Enhanced next-gen apps, such as Big Data Extensions for Hadoop 2. 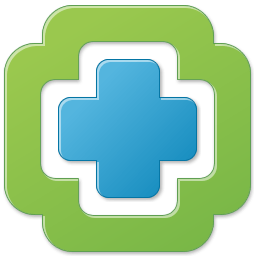 New proactive support: free Support Assistant vCenter plug-in. Openstack VIO (VMware Integrated Openstack, Beta) A standard Openstack in virtual appliance (OVA) that makes it easy for IT to run an enterprise-grade OpenStack on top of their existing VMware infrastructure. VMware, NVIDIA & Google agreement for Graphics-Rich Applications. VMware and SAP Collaborate around Mobile Security & Mobile Apps. Workspace Suite: Mobile, Desktop and Content Management unified. DBaaS: MS SQL and MySQL first. Other DB platforms will follow. effective, and durable storage for unstructured data. with Pivotal CF Mobile Services.